This entry was posted on 29th November 2017 by WoodBlocX. In the south, there have been very few really hard frosts, so even some tender bedding plants like geraniums have survived and it means that many of the bugs and other nasties are also thriving! So now is the time to go slug and snail hunting and dispose of them! Really we do need a good old cold snap to freshen things up. The constant damp and heavy recent rainfall is not good for the garden, resulting in waterlogged muddy beds that are difficult to work. So stick to ordering seeds, maintaining your garden, re-edging borders, pruning fruit trees, clearing out the potting shed and repairing your equipment ready for upcoming spring activity! Maybe this year you should think about a “No-Dig” system for your veggie patch or raised beds? It is a low maintenance system, ideal for organic enthusiasts and if combined with a WoodBlocXraised bed, will make growing your own veg easier and less of a chore! 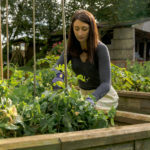 Basically you remove any surface weeds and dig out perennials (in Autumn) then simply spread a generous quantity of well rotted manure or home made compost, on top of the raised bed (at least 4 inches deep) and leave it to nature. The mulch over the surface helps to keep the soil warm and, therefore, the worms active, drawing the compost into the ground. Later on, when you are watering your raised bed crops, you will find that on an un-dug bed it is easier because it soaks away through this organic matter whilst a bed that has been dug often has a surface that will smear and cause run-off. Whilst you are planning what new vegetable seeds to order from the catalogues, why not try growing some Dwarf French beans in a WoodBlocX planter? Maxi is a good variety to try and also new White Aubergine- Ivory (what else!) is another crop that can be successfully grown in a planter. Have a look at the various WoodBlocX planter options and see how you can create your own small kitchen garden anywhere.